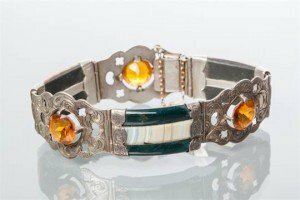 A Victorian silver and Scottish hard stone bracelet set with hardstones of various colours, engraved decoration to silver. 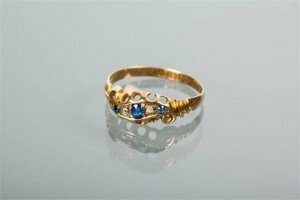 A Victorian sapphire and diamond five stone ring set with three round sapphires and two rose cut diamonds, in a boat shaped setting, hallmarked for eighteen carat gold. 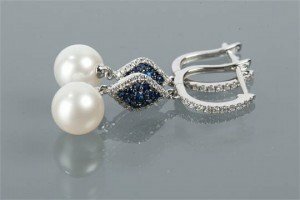 A pair of sapphire and diamond pearl earrings each with a cultured pearl suspended from a diamond and sapphire cluster, on diamond set fittings, marked “750” for eighteen carat white gold. 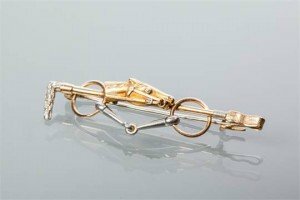 A horse and ring riding crop bar brooch modelled with the horse centrally against the riding crop, set with a single rose cut diamond, unmarked. 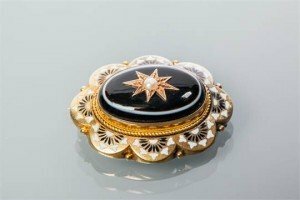 A Victorian mourning brooch with a central banded black and white stone, set with a single pearl, the border enamelled in black and white, unmarked. 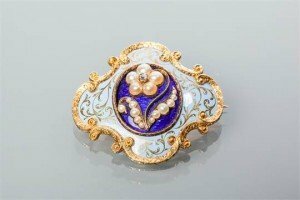 A Victorian enamel, pearl and diamond brooch of floral design, the central section enamelled in deep blue and set with seed pearls and a single diamond in a floral pattern, the surround enamelled in pale blue with scrolling decoration, and with a scrolling border, unmarked. 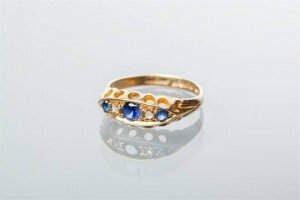 A Victorian sapphire and diamond five stone ring set with alternating sapphires and diamonds, in a scrolling design setting, hallmarked for eighteen carat gold. 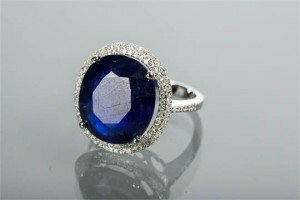 A sapphire and diamond cluster ring the central oval sapphire approximately 15 carats, surrounded by brilliant cut diamonds and on brilliant cut diamond shoulders, the diamonds totalling approximately 0.60 carats, marked for fourteen carat white gold. 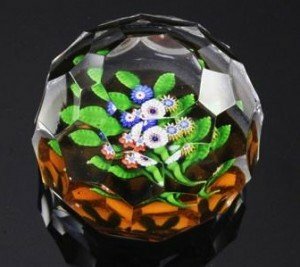 A St Louis honeycomb facetted millefiori ‘nosegay’ paperweight, late 19th century, the nosegay composed of four complex cane flowers in various colours, with five green leaves and a curved stem on a translucent amber ground. 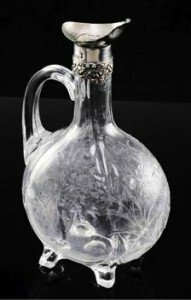 An Edwardian silver mounted rock crystal glass claret jug, c.1904, the quatre lobed flask shaped body deep wheel engraved with a hunting scene within a landscape and scrolling cartouche borders and flowers, square section applied handle and four triangular feet, the silver flower embossed mount with indistinct maker’s mark. 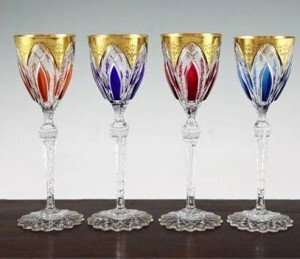 A set of four St Louis colour flash and cut hock glasses, 20th century, with panel cut colour flashed and gilded bowls, on cut and tapering stems and petal shaped feet. 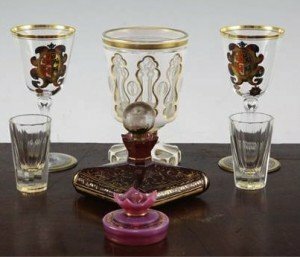 A group of Bohemian glass, 19th / 20th century, to include a white and clear overlaid glass goblet with gilt decoration, 12cm, two armorial enamelled drinking glasses, 12.5cm, a ruby and gilt decorated glass scent bottle and stopper, 8cm, two panelled shot glasses with enamelled decoration of an insect to the interior, 6.3cm and another scent bottle. 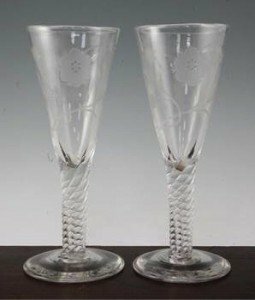 A pair of Jacobite style large glass goblets, early 20th century, each wheel engraved with a rose and the motto ‘fiat’, on spiral moulded stems and domed feet. 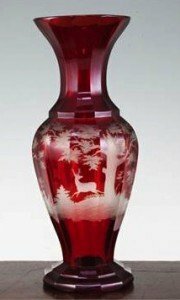 A Bohemian ruby glass multi-facetted baluster vase, late 19th century, wheel engraved with deer in a forest, 31.5cm. 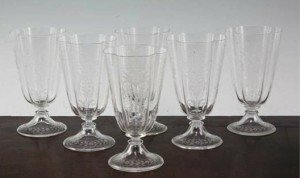 A set of six Lobmeyr quatre lobed drinking glasses, late 19th century, in Renaissance revival style, finely wheel engraved with fantastical birds, flowers and scrolling leaves, on a conical foot with flower garlands and wheel engraved Lobmeyr mark, 14.3cm. 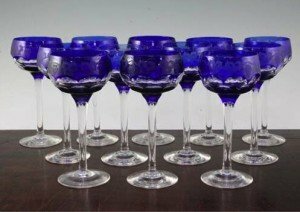 A set of twelve John Walsh blue flashed cut champagne glasses, with wheel engraved fruiting vine border above a facetted band to the blue bowls, on clear stems and domed feet, etched mark Walsh. 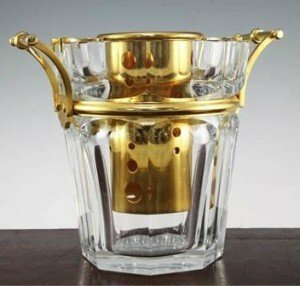 A Baccarat crystal Moulin Rouge design champagne ice bucket, of octagonal tapering form with gilt metal mounted girdle and handles and a separate pierced inner bucket, etched mark to base and stamped mark to support to inner liner. 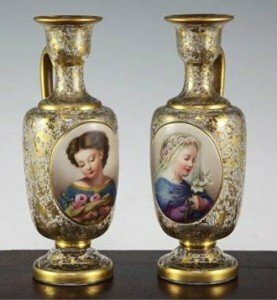 A pair of Bohemian enamelled and gilt decorated glass ewers, late 19th century, each painted to overlaid glass oval reserves with a young woman holding flowers, the ovoid body, neck and feet profusely gilded with scrolling leaves and tendrils. 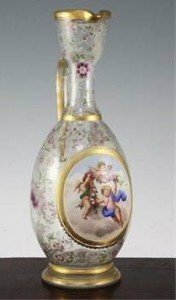 A Bohemian enamelled glass ewer, late 19th century, with an overlaid oval reserve enamelled with three cherubs holding garlands of roses amid clouds, the clear glass body painted in colours with trailing flowers and scrolling tendrils and leaves, with gilt borders. 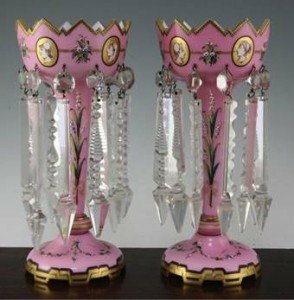 A pair of Victorian pink and white overlaid glass table lustres, with crenellated rims, decorated with classical portrait medallions and flower sprays, gilt strap work borders, suspended with prismatic cut drops.